A fantastic mid-century Maitland Smith console table with heavy glass top and tessellated stone base. A fantastic mid-century Maitland Smith console table with heavy glass top and tessellated fossil stone base. This table would also work well as a sofa table providing a much useful surface in one of the most used rooms of the house. 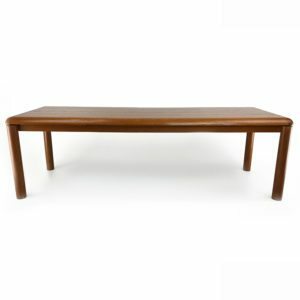 Manufactured in 1970 the table is a wonderful example of mid-century furniture from Maitland Smith. The surface is a piece of heavy beveled edged glass. The composite structure of the fossil base creates a texture that complements the angular tusk like supports of the table creating a prehistoric feel with a fabulous mid-century twist. The console table is in very good pre-owned condition with wear commensurate with age. Fortunately there are no cracks or signs of repair on the base however, there is a small amount of grout missing where the upward supports of the table meet the base. The glass top shows a tiny chip and a couple light scratches on the surface of the glass. Lastly please view all photographs as they serve as an extension of the description and condition report.